Parahyangan Golf Bandung designed by Bob Moore - lead designer of USA-based JMP Golf Design Group sets up in a dramatic valley-to-mountain landscape. 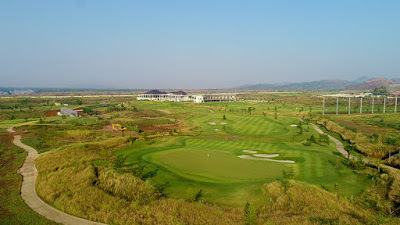 The Bandung golf course located beyond Kota Baru town and is a component of Kota Baru Parayhangan, a carefully planned, mixed-use development spreading over an area of 1,250 hectares. Parahyangan navigates through two distinctly different types of terrain and around some offshoot bays of the Saguling Lake. Seven bridges spanning from 20 – 70 meters in length to cross the bays, with holes framed in local farm crops. Incomparable visual drama is one of the great strengths of this 18-hole championship layout. The course flows along the deeply incised ravines and lake edges and climbs onto the flanks of surrounding mountains offering commanding views of the valley floor. 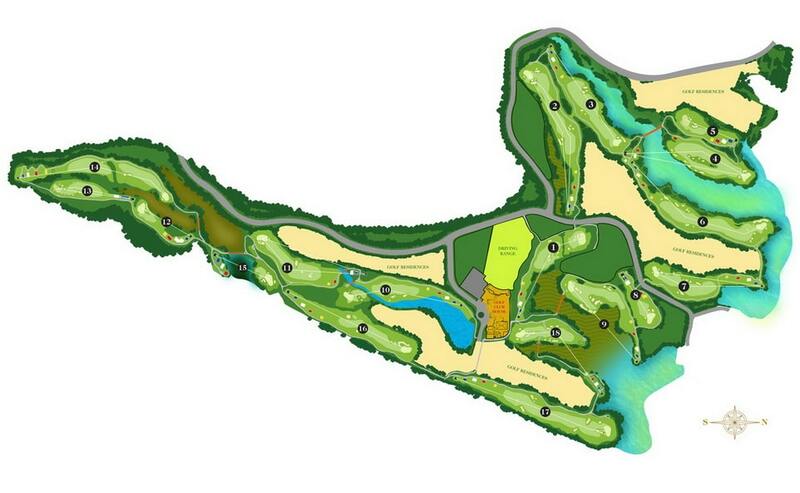 The course also features a highly-strategic layout featuring multiple lines of play on virtually every hole. The front nine sets out from the valley into an awe-inspiring landscape that is dominated by steep hills and mountains, and that is home to ravines and thousands of years old deep gorges. Many holes offer stunning views, and particularly from the tee box of the downhill par-5 fifth. The steep hills and mountains are home predominantly to local farmers who make a living from agriculture and vegetable farming. Seamlessly their workspaces integrate with golf situated in this part of the site. The back nine routing is to an open plain that borders Lake Saguling. The main activity on the lake’s shores is vegetable farming and growing of rice. Parahyangan adds golf to the activity list. Lake Saguling’s many tributaries and waterways have created a patchwork of typical landforms with shoreline-features that include plateaus, bays, gorges and streams, and small valleys. And it is here, that Bob Moore cleverly created a series of golf holes (twelve to sixteen) - that connect and integrate these unusual landforms and shoreline features, making room for golf holes, unique to Indonesia. The 9,000 square meters spacious clubhouse has every modern facility that a golfer expects. From the plush locker rooms, clean changing areas, well-stocked pro shop, and to top-notch practice areas, the Parahyangan facilities are all first class. Caddies are well groomed and a welcome smiling addition to any round. Whether it’s the front- or the back nine, every hole at Parahyangan offers a different vista that surely completes for attention with golf. Local advice is to take it one golf shot at a time. Parahyangan leaves an indelible impression with first-time visitors and seasoned golfers alike. Have you played golf at the Parahyangan Golf Bandung and took some nice photos that you would like to share with other golfers? Send them to us and we may upload them here. Thank you in advance!